The First Methodist Church was organized in 1843 and was known as Adeline’s Chapel. Records show that a Sabbath School was organized on June 18, 1843 on property located two miles south of town across the Athens Wagon Road (now the Commerce-Athens Highway) from the home and farm of the late Mr. T.P. Hudson, now owned by Mr. C.W. Hood, Jr. The Adeline Church was torn down in 1851, was moved to Harmony Grove, now Commerce, and was located on Shankle Heights opposite the present home of Mr. and Mrs. Billy White. The church was again moved and located near the old Farabee home on south Broad Street just outside the city limits, some quarter of a mile on the East side of the railroad. The Church was known as Sandy Level. The site is still marked by a small graveyard. 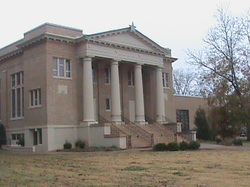 In 1874 The church was moved to its present site, where a one-room frame church was built and the name was changed to Harmony Grove Methodist Church. In 1903 under the ministry of the late Reverend G. M. Eakes, the church launched a building project using the old church as the main body. Additions were made, and a larger more commodious building resulted. The building was completed in 1904. The name had become by now The Commerce Methodist Church, with the changing of the name of the town. This building was used until a campaign for the present edifice was begun in 1919 when the old church was torn down, a basement was excavated, and a modern cream brick structure was built in the early 1920’s at a cost of approximately $50,000. An annex was built in 1954 at a cost of $13,000 and is used today for classrooms. In 1958 an educational building was erected at a cost of $40,000. It contains a lovely chapel, a large well-equipped nursery, and spacious classrooms for children and youth. In 2000 a family life center with seating for 250, a full kitchen, and gym was built and furnished. The upstairs of the building has unfinished space for 3 Sunday school rooms and men’s and women’s restrooms with showering facilities. The fellowship hall has a stage equipped with a Clavinova and baby grand piano. The front of the building has cream brick to match the current structure with a breathtaking stained glass window with a back-lighted Methodist insignia. Since 2001 numerous improvements and additions have taken place throughout all of our facilities. These include new roofing on the Sanctuary and educational buildings, new asphalt on the parking lot, complete refurbishing of the stained glass windows, new playground equipment, new sound system for the Family Life Center, and landscaping improvements over all the grounds. At this writing we are completing one wonderful renovation and stand ready to begin the second. We have renovated the Cherry Street house and are moving the Church Offices into that spacious and accessible setting. We are finalizing plans for the complete renovation of our lovely Sanctuary from foundation to Christmas Star!! Come be a part of the next 158 years! Contact the church office for more information!